We are currently working on 2 properties available for short term rental with full furnishings in Appleton. We also have a beautiful new construction home coming at the end of summer in Greenville. Over the next year, you'll also see some amazing Assisted Living homes from our family to yours! With 3 bed, 1.5 bath, attached 2 car garage, first floor laundry, and a nice patio off the dining room, this home is only 15 yrs old and is ready to move in with new carpet, paint, lights, hardware and more! The roof, fascia, gutters, garage door, furnace and hot water heater are all about 2 yrs old, and there are brand new kitchen appliances included for you. The location is PRIME and is close to absolutely everything...shopping, YMCA, tunnel to the CE trail, movie theater, groceries, gas....everything! It is in the Kimberly school district, but located in the Town of Buchanan for lower taxes and water. This home is a twindo and is listed as a separate unit, but you could also purchase the entire building and keep the amazing tenant on the other side and collect the rent which would make your mortgage payments equal to having a home that only cost about $90,000!! Ask about it if you're interested in the details. See it TODAY before it is gone. Click on the pics below to enlarge. This home is in a wonderful neighborhood and GREAT location! With tons of updates, all new kitchen and brand new appliances, you can enjoy the rest of the summer on the large, new deck and just move right in with nothing left to do. Come and see it before it's gone, and make this gem your new home! There are 1500 sq ft in this home with 2 bedrooms on the main level with a full bath, and 2 more huge rooms upstairs with a half bath. Also has a 2 car attached garage and a basement that is ready to finish. This home is completely remodeled and features 3 bedrooms, 2 full baths, 24x24 detached garage, 4 seasons room, shed, partially finished basement and a nice deck. There are 1520 sq ft on the main level and another 572 sq ft finished rec room in the basement. Be the envy of everyone who comes to visit you when you live on the pond with THIS view! This is NOT a drive by...you MUST walk in the front door and have your breath taken away by this immediately calming view. Enjoy nights on the covered patio with the ceiling fan lightly blowing and take in the sunset out your giant windows or off your patio to end every single day. THIS is home! The home is all custom and really needs to be experienced to believe! This home has 2499 sq ft, 4 beds, 2.5 baths, birch cabinetry, first floor office, 3 car garage, 9 ft ceilings in basement, 9 ft ceilings on first floor with 18 ft ceilings in main section of the home with a tall wall of windows to the pond and sunsets. Master bath features a tiled walk-in shower with 2 shower heads and glass door. If you have a stressful job, THIS is the home to relax in every evening :0) See it today! Enjoy the most amazing views in all of North Appleton! This home is built on a pond with three beautiful islands that are lighted at night. We have a covered patio with a ceiling fan to blow away the bugs on those nice summer nights as you enjoy the serenity of the views and peacefulness of the location. The home is all custom and really needs to be experienced to believe! Come see it today before it's gone. We have one more that will be finished soon on the other side of the pond as well. This home has 2499 sq ft, 4 beds, 2.5 baths, first floor office, 3 car garage, 9 ft ceilings in basement, 9 ft ceilings on first floor with 18 ft ceilings in main section of the home with a tall wall of windows to the pond. Master bath features a tile walk-in shower with 2 shower heads and glass door. Click the link to see the spec sheet for this property with all the room sizes. This amazing home is almost completely new construction! It has a beautiful view of nature, wildlife and a creek running through the backyard from a huge wraparound deck. There's 5 beds, 3.5 baths, first floor laundry, and granite countertops in the kitchen and all bathrooms. This home has every luxury item upgrade you can imagine and way too many to mention! A total Must See!! This home is a great 6 yr old ranch in a wonderful newer subdivision with 3 bedrooms and 2 full bathrooms and a 3.5 car garage near the high school. There's nothing left to do but move in. We're even including the brand new stainless appliances. There's lots of closets and storage, an open concept with vaulted ceilings, and sliding doors to the patio. Click on a thumbnail below to open a photo viewer. This 6 year old home was recently remodeled to include a newly finished basement with a HUGE 4th bedroom, a full bath, and a large family room with wet bar. On the main level, you will find 3 bedrooms, 2 full baths, and first floor laundry with a walkin closet. There is a ton of closet space throughout the entire home! There is also a 3.5 car garage, 0.4 acre lot, and a HUGE maintenance free composite deck along the back of the home. The entire home has fresh paint and all new flooring, lighting and hardware throughout. You will also find 200 amp electrical service, a new water heater, and a new furnace. It's another MUST SEE! 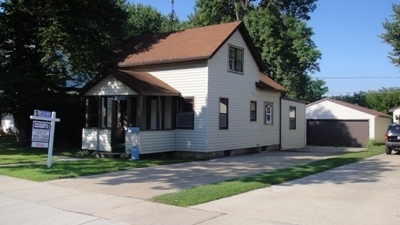 This great 3 bedroom, 2 bathroom home is in De Pere. The first floor boasts a brand new kitchen with all new stainless appliances, a first floor laundry room, a full bath and a huge master suite with its own full bath and walk-in closet. On the second floor you'll find 2 large bedrooms. The basement is clean and friendly awaiting your projects. New siding, windows, garage door and roof, flooring, paint, kitchen and baths, lights, water heater and a whole lot more! With a super convenient location in walking distance to just about everything and close to the highway, this one is a must see! This great home has 4 bedrooms, 3 full bathrooms and a finished lower level including a family room with gas fireplace and huge laundry/storage room. The home also boasts a brand new roof, flooring, trim, paint, fixtures and more! The neighborhood is quiet, and only 2 minutes from the highway and convenient to everything in an excellent school district. Brand new stainless appliances included are: dishwasher, built-in microwave, stove and side by side refrigerator with ice and water service in the door. The master has a walk-in closet and full bath with garden tub and double sinks. There's also french doors off the dining area leading to a nice deck overlooking the landscaped backyard with a one car shed that has a loft. Come see this great home as it will not last long at this price!! This 3 bedroom home is located on a nice, quiet street 2 minutes from the highway! Everything has been redone and most of the basement has been finished to add an extra family room as well as an office/4th bedroom. The HUGE garage is every man's dream! With a new roof, siding, windows, and a whole lot more, this home is a must see immediately! Call us to set up a showing 920-740-3599. Click this link to download the spec sheet for this property. Click on any thumbnail pic below to open a photo viewer. This charming 3 bedroom, 1 bath home on the boulevard is a great move! Why rent when you can own? Includes built-in microwave, refrigerator and stove. Priced at only $69,900 this completely remodeled home with brand new central air is a great deal, so call Kyle at 920-912-4302 today for a showing! This 4 bedroom 2 bath home with a 2 car garage will be sure to please for only $108,900. 100% all new plumbing, electrical, furnace, water heater, sump pump, central air, windows, kitchen, baths, flooring, walls, paint, fixtures, etc. New New New! This home features 4 bedrooms and 1 full bath with a finished rec room in the basement. Everything has been updated and the home is priced to sell! You'll enjoy a great neighborhood and huge backyard only minutes from Hwy 41. All the appliances are included so all you need to do is move in! With the tax credit expiring soon, this home is going to go fast. This home has 4 bedrooms, 2.5 baths, 2 car attached garage, 2272 sq ft with a woodburning fireplace and a full unfinished basement that sits on a HUGE beautiful lot with the walking/biking trail at the rear! With new flooring, all new lighting, paint, hardware, fixtures, new Whirlpool dishwasher and built-in microwave and TONS of closet and storage space, this home is a super deal and is sure to please! Only 15 years old, the location is as good as it gets...only 2 minutes from the highway and walking distance to shopping, grocery and restaurants, the home is located in a quiet cul de sac and is priced to sell at more than $30,000 under the fair market value! Quiet neighborhood with a great view of Little Lake Butte Des Morts and low low Town of Menasha taxes! This 3 bedroom 1.5 bath home is sure to please with 95% new construction!! You will be blown away at the detail of the beautifully stained handmade tongue and groove Popple on the vaulted ceiling. Then, take a trip up the spiral staircase to the loft leading you out to a HUGE upper deck overlooking the lake...perfect for those summer mornings and a cup of coffee or the evening get togethers with friends. The large circular patio outside the sliding glass doors is a great place for those barbeques and also takes advantage of those great lake views. The kitchen, with stainless steel appliances and a breakfast bar, is also faced towards the lake so you can even enjoy the views from indoors. This home is a must see, and is sure to sell quickly! Click on the thumbnails below to enlarge. This 3 bedroom 1 bathroom ranch home is 1500 square feet with a nice backyard that backs up to a parklike area. Located in a great neighborhood on a quiet street, this home is within minutes of everything! Completely remodeled with brand new windows, all new flooring, new paint, new bathroom, and a modern kitchen with custom etched glass in the cabinets! This home also features a woodburning fireplace, and is sure to be the perfect fit for many. Hurry as this one won't last long! 3 bedroom, 1 bath with a 2 car garage in a very desireable, quiet neighborhood next to a community park and close to Sunset Park. This home is sure to please! 2 bedrooms with hardwood flooring on the main floor and one upstairs with a huge play or sitting area up there as well (could easily be made into a 4th bedroom). Nice dry basement, 2 car attached garage and desireable, quiet neighborhood. Most windows have been replaced, new siding, roof and water heater. The full bathroom was updated 5 years ago. All you really need to do is update the flooring in the kitchen and give a little attention to the rooms upstairs, and this home is perfect! The home is vacant and ready to move in at any time! 3 bedroom, 1.5 bath close to shopping, schools, and easy highway access. This home is completely remodeled and the location is very desirable! Quiet neighborhood within walking distance of just about everything, and only a minute from Hwy 41. Entire basement has been finished with a new egress window and third bedroom, also family room, laundry room, and half bath! There's a big, beautiful new deck off kitchen, and refinished hardwood floors in the living and bedrooms, with ceramic tile in the kitchen and baths. Decorative curbing added to keep the landscaping beautiful with low maintenance and great "curb" appeal. Everything inside is new and all the brand new appliances have been purchased for you and are included with the home with a dishwasher and garbage disposal as well! Do NOT miss the Open House this Sunday. The last two homes we remodeled sold at the open house, and this one will too! You simply MUST see this home and move quickly because it will sell FAST! Click on the thumbnails below to enlarge the pics. This 3 bedroom 1 bathroom home with a 2 car garage on a roomy corner lot is only 1 block from the new waterpark and close walking distance to the schools. All the roads have just been redone with all new concrete! Great Neighborhood. Brick Ranch with 3 bedrooms and 1 bath with a finished basement in a great neighborhood! This great home has 2 bedrooms, 1 bathroom and a HUGE bonus room upstairs as well as a full basement (washer and dryer included) and oversized 2 car garage on a big beautiful lot! Brand new kitchen with new ceramic tile floor and all new Frigidaire appliances including: refrigerator, glass top stove and dishwasher. Beautifully refinished hardwood floors and gorgeous crown molding in the living and dining room and new carpet in the bedrooms. The bathroom is also completely new and has ceramic tile. Brand new roof, insulation and central air as well as updated electric, new plumbing and a newer furnace and water softener means you won't need to be doing any work or worrying about maintenance costs for awhile! Come see this incredible home as it will not last long!! The home's value is approximately $115,000 so this is one that will certainly give you instant equity :o) Click on pictures below to enlarge.